Love can make ya do crazy things, especially if you've already got a few screws loose! 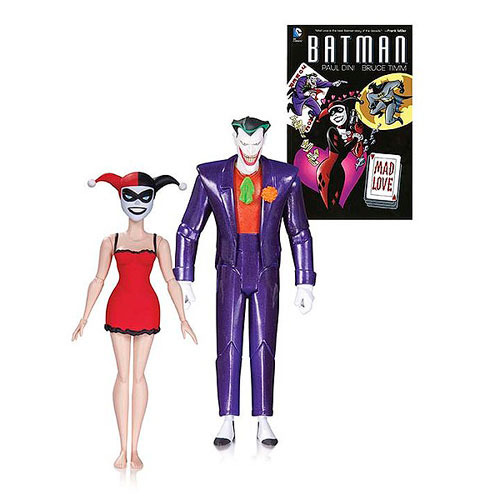 Gotham City's resident lovebird-inmates, the Joker and Harley Quinn, bring mayhem into your home with this special 2-pack based on their appearances in Batman Adventures: Mad Love. Including a paperback edition of Mad Love, these figures are eye-catching variants of character designs fan loved in Batman: The Animated Series! Harley Quinn measures approximately 5 1/2-inches tall, while Joker stands about 6-inches tall. Ages 14 and up.